Hello and welcome to a week of Easter inspiration on my blog. 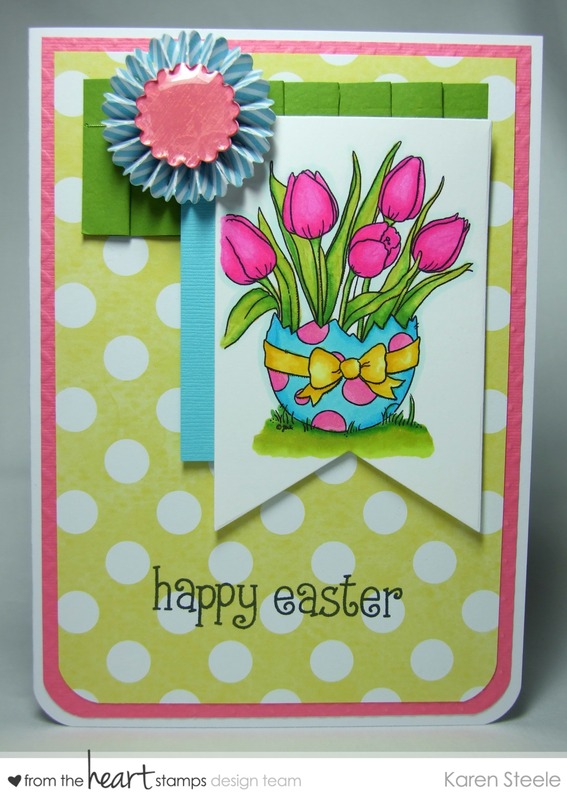 Today I’m sharing this card that I have made using this pretty spring image available at From the Heart Stamps called Easter Egg Tulips and our new sketch #143. We would love for you to join us this week in our sketch challenge – and don’t forget our Stamp of the Month challenge also. All rules and details for our challenges can be found HERE. For this card I also used : Bazzill embossed cardstock, Bazzill pleated border, American Crafts – Dear Lizzy ‘Neapolitan’, Sizzix Banner Die, Tim Holtz Strip Rosette Die, Epiphany tool, Spectrum Noirs, sentiment from Lawn Fawn – ‘Happy Easter’ and a WRMK Corner Chomper. < Previous Lili Pad Frog…. Next > Easter Bunny milk cartons….. This is so sweet, Karen. The colors are fabulous and I like your slight adjustment to the sketch! Love those gorgeous pink tulips! I can hardly wait to see my tulips bloom! Love the polka dot background, too! Lovely Easter card! Love the pretty tulips and polka dot background! Beautiful! Love those bright colors! Can a card be called attractive? Because it’s how I feel about this bold colored card. Brilliant paper pleated detail and rosette, beautifully colored image! What a beautiful Easter card, Karen!! I love the colors and that is such a fun and festive stamp!! Gorgeous take on the sketch!